Don’t forget to enter my Trader Joe’s Dark Chocolate Giveaway before it ends on Sunday at midnight! Last week, a friend and I went to see Julie and Julia. The film combined two of my loves, food and blogging, so naturally I adored it. It was charming and delightful, and Julia Child (as channeled by the always stunning Meryl Streep) completely captured my heart. Julia Child had a zeal and passion for life that inspired cooks and non-cooks alike. She savored every moment, enthusiastically took risks, and fearlessly spoke her mind. In short, a timeless woman whose qualities I hope to develop as I age. I have officially added Julia to the list of people I would invite to my imaginary dinner party. I think she would really enjoy my rum cake. Other invitees would be Stephen Colbert, J.R.R. Tolkien and Moses. Wouldn’t that be something? 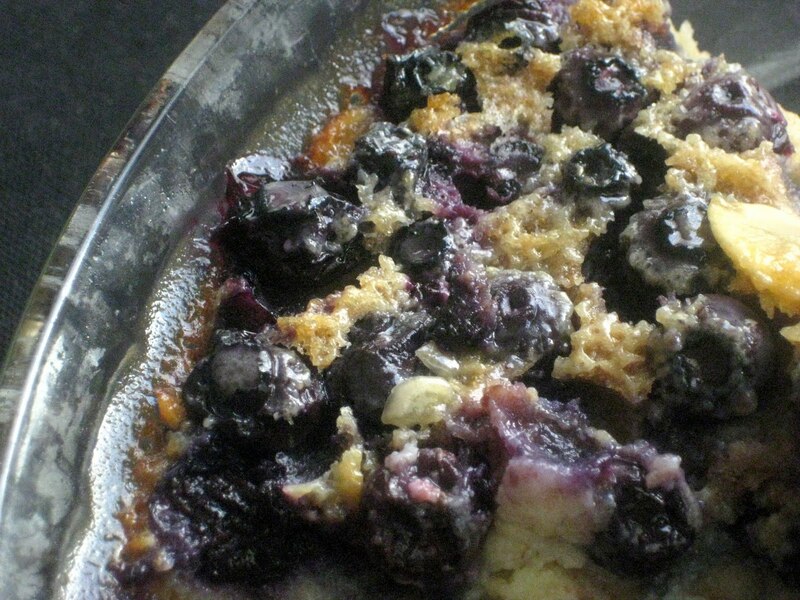 In honor of Julia Child, let’s have some blueberry clafoutis, shall we? Clafoutis is a French dessert of baked custard and fruit. It is typically made with cherries, but I had blueberries on hand, and therefore that is what went into the baking dish. Simple to make, yet so delicious, clafoutis can be served warm or chilled. Also, it has a wonderful name (pronounced kla-foo-TEE) that I want to repeat out loud over and over. Preheat oven to 350 degrees. Butter and lightly flour a pie dish. Toss in the blueberries and almonds. In a bowl, whisk together eggs, sugars, flour and salt until smooth. Add milk, Amaretto (or almond extract), and vanilla extract. Whisk until smooth. Pour into baking dish. Bake for 40-45 minutes until lightly browned. Place on a cooling rack for 10 minutes. Dust lightly with powdered sugar. Serve slightly warm or chilled. Love it! I have been eyeing Julia's book, decided whether or not to purchase…this just might convince me! Sounds delicious! I just recently cooked from Mastering the Art for the first time. Can't wait to cook from it more! I loved the book and am going to see the movie this weekend! I can't wait! You are adorable. I've been meaning to see the movie for the same reasons as you, now I am way more motivated. She lived in Santa Barbara at some point so people love to highlight her favorite spots in town. That looks sooooo good! Another one of your posts to star in my reader…I really have to try one of your recipes soon! Yummy! Have a wonderful day! that looks so easy to make! i gotta try it! I absolutely adore Julia Child. I listened to her book on tape a while back when driving to Tennessee, then I read Julie & Julia a few weeks ago. I really hope I like the movie, whenever I get the chance to check it out! And thank you for sharing this recipe! It sounds amazing! My goodness that looks DELISH!